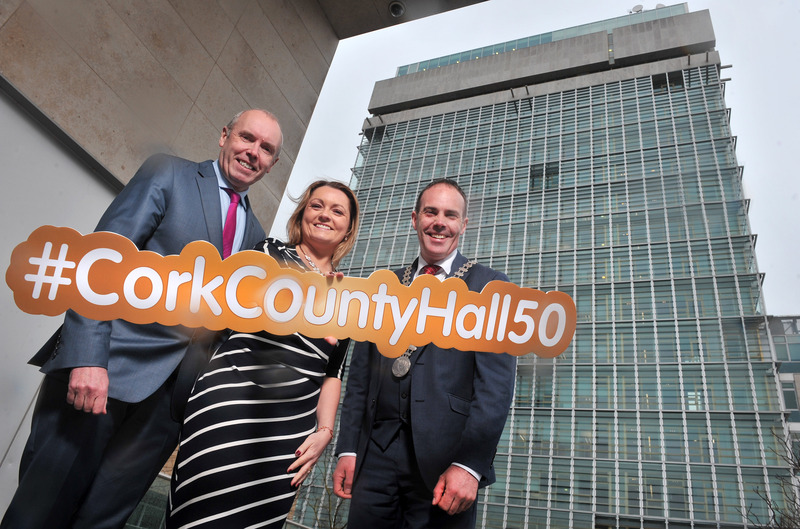 Pictured at Cork County Hall which will celebrate its 50th anniversary on April 16th are Tim Lucey Chief Executive Cork County Council; Nicola Radley Corporate Affairs, Cork County Council and Mayor of the County of Cork, Cllr Declan Hurley. 16th April 2018 was a landmark day for a landmark building. Cork County Hall was officially opened 50 years ago on the 16th April 1698. Designed by former Cork County Council Architect, Patrick L MacSweeney, Cork County Hall was Ireland’s first skyscraper at 64.3 metres, retaining this status up to 2008. To mark the occasion, the people of Cork were invited to visit Cork County Hall where a special exhibition was launched, telling the story of the building, from Inception to Completion. Mayor of the County of Cork, Cllr Declan Hurley and Chief Executive of Cork County Council, Tim Lucey also unveiled a commemorative plaque to mark the occasion. Prior to Cork County Hall, staff of Cork County Council were spread throughout the county, with council meetings taking place in the Courthouse on Washington Street. A space was required which would provide a one stop destination for members of the public to transact with the Council. Cork County Hall was this solution. Taking three years to construct at a cost of £500,000, Cork County Hall was a striking architectural concept which had not been attempted previously in Ireland. When completed in 1968, Cork County Hall was a high rise solution, designed as a single, elegantly proportioned, vertical block with a textured surface of precast concrete tracery which eliminated the need for scaffolding during construction. Throughout the years the original distinctive concrete facade became severely eroded. An expansion scheme saw them replaced with an extra storey extending Cork County Hall’s height to 67m with a glazed pavilion offering panoramic views across Cork. The addition of the Cork County Council Library Service Headquarters 2010 was another milestone, bringing a focal point to the County Library for the first time since its establishment 84 years earlier. Cork County Hall campus continues to expand, with the recent opening of the Business Growth Hub, an economic driver for the Cork region and the almost completed Cork County Fire and Building Control Headquarters, site of the former Teagasc offices. The exhibition, from Inception to Completion, is currently on display and will be for the next number of weeks.